Moustafa Elhadary did not know much about Penn State when he arrived in the United States for the first time this summer. Everything from the weather to American college coursework was uncharted territory. But he knew about one of the school’s greatest traditions, and he knew he wanted to be part of it. He got his wish on Nov. 1, when he and friends took a bus from Penn State Behrend to University Park to watch the Nittany Lions’ game against the University of Maryland. In Dubai, Elhadary’s home since 2007, American football is all but a myth. Fùtbol, better known as soccer in the U.S., is the most popular game there, and everyone is encouraged to participate and follow the sport. For Elhadary, football was a welcomed change. From the moment he entered Beaver Stadium, Elhadary was overwhelmed by the sheer spectacle of a football Saturday at Penn State. “I was really impressed by the number of people there. There were just tons of people,” he says. He was further astounded once the game began. First downs, turnovers, illegal procedures — all of it was entirely new for Elhadary. As the game continued, things became clearer. With each ensuing cheer and boo, Elhadary began to feel as if he was a part of something. This synergy was especially evident with 3:18 left in the third quarter when Christian Hackenberg threw an eight-yard touchdown to Jesse James to give Penn State a 16-7 lead. Elhadary says it was even more noticeable after Maryland took the lead with less than a minute left in the game. Elhadary says he was upset that Penn State lost 20-19, but he was happy he was there to see it. His football knowledge remains a work in progress for him, but he’s committed to educating himself; he’s already planning on attending the Michigan State Blue Out game on Nov. 29. He has also learned one of the favorite pastimes for football fans: trash talking. 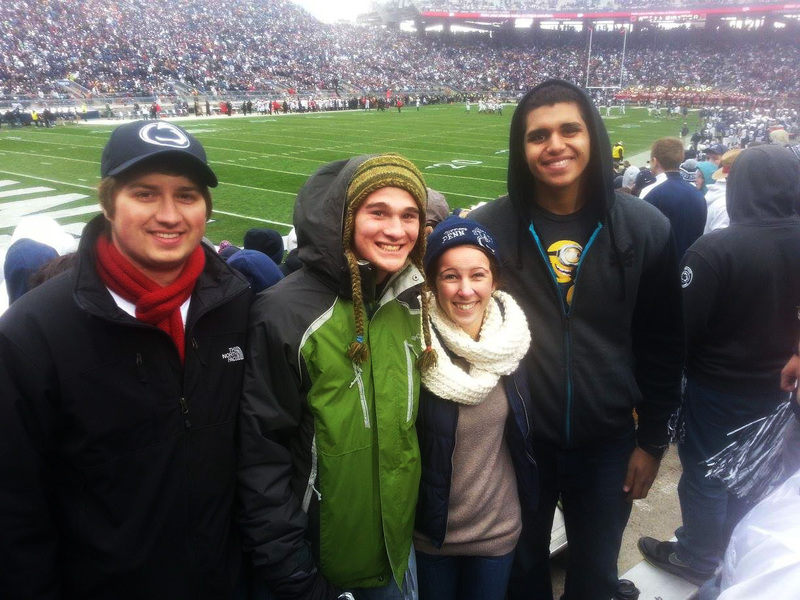 Moustafa Elhadary attended his first Penn State football game on November 1. Here he is shown (far right) with friends Kenton Klobusnik (far left), Matthew Wheeler and Alyssa Anderson. This entry was posted in Around campus, Far from Home, Fun stuff, School of Engineering, Student News, Uncategorized and tagged Behrend, Dubai, Far from Home, football, futbol, MAryland University, Moustafa Elhadary, Nittany Lions, Penn State Erie, soccer. Bookmark the permalink.